If you have any questions about the TUSCAN SUN information page below please contact us. The large superyacht TUSCAN SUN is a motor yacht. This 45 m (148 ft) luxury yacht was produced at Navantia - n Fernando Shipyard (Ex - Izar) in 2006. Superyacht TUSCAN SUN is a grand yacht that can sleep as many as 12 passengers on board and has a total of 9 crew. The graceful motor yacht has been envisaged with the naval architecture of Izar. Luiz De Basto Designs acted on her interior design brief. The 45-meter (148-foot) tri deck M/Y TUSCAN SUN was built in the Spanish yard, Izar (now called Navantia), however they have now ended their short albeit successful production of custom yachts and returned to the more predictable business of commercial and naval ships. The yacht's general design work came from Izar. The professional naval architecture drawings are the work of Izar. Motor Yacht TUSCAN SUN received her elegant interior designing from the interior design office of Luiz De Basto Designs. Built by Navantia - n Fernando Shipyard (Ex - Izar) the vessel was built in the yacht producing country of Spain. She was successfully launched in San Fernando in 2006 before being handed over to the owner. The hull was constructed with steel. The motor yacht superstructure is fabricated extensively with aluminium. With a width of 9 metres / 29.5 ft TUSCAN SUN has spacious size. A fairly shallow draught of 2.5m (8.2ft) determines the number of ports she can berth in, depending on their particular depth at low tide. She had refit improvement and alteration work completed in 2007. The yacht engages twin reliable CATERPILLAR main engine(s) and can reach a swift max speed underway at 15.5 knots. The main engine of the yacht generates 1673 horse power (or 1231 kilowatts). Her total HP is 3346 HP and her total Kilowatts are 2462. Connected to her Caterpillar engine(s) are twin screw propellers. This yacht’s efficient cruise speed is 12 knots which enables a range of 3300. With room for a maximum of 12 visiting passengers overnighting, the TUSCAN SUN accommodates them in luxury. The boat has room for approximately 9 professional crewmembers to maintain and sail. 44.8 metres / 147.5 feet. The main engines are two 1673 HP or 1231 Kilowatts Caterpillar. The Model type is 3512B diesel. In October 2009 TUSCAN SUN sailed to Southampton, in United States. This motor yacht also traveled the area encompassing Suffolk County during the month of October 2009. This motor yacht has a teak deck. 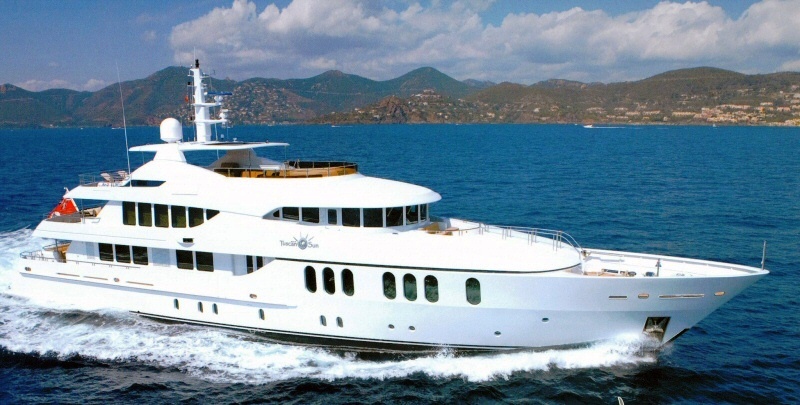 The luxury yacht TUSCAN SUN displayed on this page is merely informational and she is not necessarily available for yacht charter or for sale, nor is she represented or marketed in anyway by CharterWorld. This web page and the superyacht information contained herein is not contractual. All yacht specifications and informations are displayed in good faith but CharterWorld does not warrant or assume any legal liability or responsibility for the current accuracy, completeness, validity, or usefulness of any superyacht information and/or images displayed. All boat information is subject to change without prior notice and may not be current.